For all my fellow Michiganders!!! Alpena is the home of the world’s largest cement plant. Rogers City boasts the world’s largest limestone quarry. Elsie is the home of the world’s largest registered Holstein dairy herd. Michigan is first in the United States production of peat and magnesium compounds and second in gypsum and iron ore..
Colon is home to the world’s largest manufacturer of magic supplies…. The state Capitol with its majestic dome was built in Lansing in l879. there are no longer wolverines in Michigan. The Packard Motor Car Company in Detroit manufactured the first air-conditioned car in 1939.
established by any of the states. It was founded by priests. Originally named Cathelepistemian and located in Detroit . The name was changed in 1821. The university moved to Ann Arbor in 1841. The city of Novi was named from its designation as Stagecoach Stop #6 or No.VI. Michigan State University has the largest single campus student body of any Michigan university. It is the largest institution of higher learning in the state and one of the largest universities in the country. Michigan State University was founded in 1855 as the nation’s first land-grant university and served as the prototype for 69 land-grant institutions later established under the Morrill Act of 1862. It was the first institution of higher learning in the nation to teach scientific agriculture.. The largest village in Michigan is Caro. Michigan’s state stone, the Petoskey, is the official state stone. It is found along the shores of Lake Michigan . the Straits of Mackinac, which is where Lake Michigan and Lake Huron meet. The “Mighty Mac” took three years to complete and was opened to traffic in 1957. Gerald R Ford grew up in Grand Rapids and became the 38th president of the United States. He attended the University of Michigan where he was a football star. He served on a World War II aircraft carrier and afterward represented Michigan in Congress for 24 years. He was also an Eagle Scout, the highest rank in Boy Scouts. The painted turtle is Michigan ‘s state reptile. The western shore of Michigan has many sand dunes. The Sleeping Bear Dunes rise 460 feet above Lake Michigan . Living among the dunes is the dwarf lake iris the official state wildflower. the first soda pop made in the United States ….. In 1862, pharmacist James Vernor was trying to create a new beverage when he was called away to serve our country in the Civil War. When he returned, four years later, the drink he had stored in an oak case had acquired a delicious gingery flavor. Michigan is the only place in the world with a floating post office…..The J. W. Westcott II is the only boat in the world that delivers mail to ships while they are still underway. They have been operating for 125 years. Michigan has more shoreline than any other state except Alaska . The Ambassador Bridge was named by Joseph Bower, the person credited with making the bridge a reality, who thought the name, Detroit-Windsor International Bridge , as too long and lacked emotional appeal. Bower wanted to symbolize the visible expression of friendship of two peoples with like ideas and ideals. Forty of the state’s 83 counties adjoin at least one of the Great Lakes . 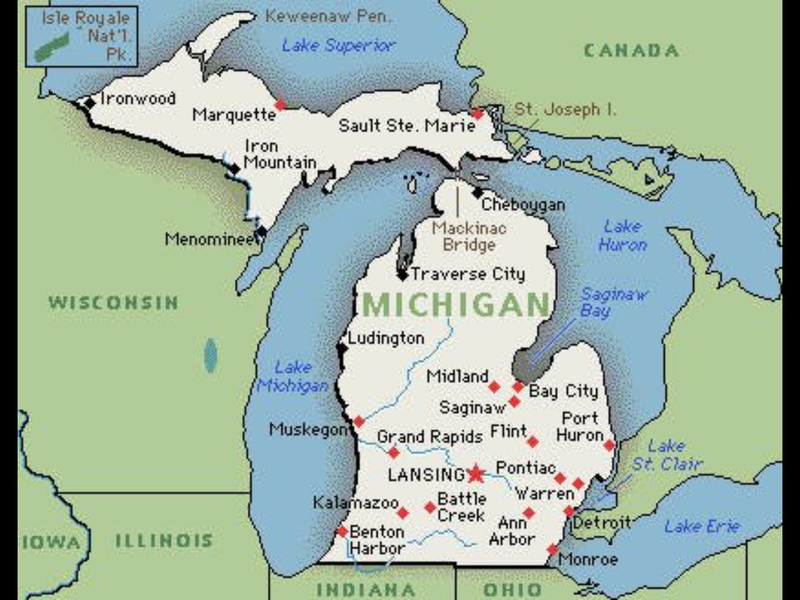 Michigan is the only state that touches four of the five Great Lakes . Standing anywhere in the state a person is within 85 miles of one of the Great Lakes ..
Michigan includes 56,954 square miles of land area, 1,194 square miles of inland waters, and 38,575 square miles of Great Lakes water area. Sault Ste. Marie was established in 1668 making it the oldest town between the Alleghenies and the Rockies. Four flags have flown over Michigan – French, English, Spanish and United States . Isle Royal Park shelters one of the largest moose herds remaining in the United States ….. Some of the longest bulk freight carriers in the world operate on the Great Lakes. Ore carriers 1,000 feet long sail Michigan ‘s inland seas. The Upper Michigan Copper Country is the largest commercial deposit of native copper in the world. The 19 chandeliers in the Capitol in Lansing are one of a kind and designed especially for the building by Tiffany’s of New York. Weighing between 800-900 pounds apiece, they are composed of copper, iron, and pewter. The first auto traffic tunnel built between two nations was the mile-long Detroit-Windsor tunnel under the Detroit River . The world’s first international submarine railway tunnel was opened between Port Huron, Michigan, and Sarnia, Ontario, Canada in 1891. The nation’s first regularly scheduled air passage service began operation between Grand Rapids and Detroit in 1926. In 1879, Detroit telephone customers were first in the nation to be assigned phone numbers to facilitate handling calls. In 1929, the Michigan State Police established the first state police radio system in the world..
Grand Rapids is home to the 24-foot Leonardo Da Vinci horse, called Il Gavallo. It is the largest equestrian bronze sculpture in the Western Hemisphere . Was that interesting or what? 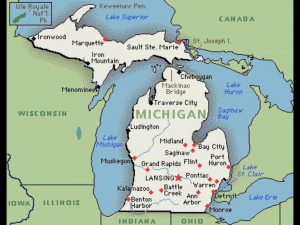 With all of the negativity due to poor economics and housing markets these days, let us try to remember and say something positive about our beautiful and interesting Michigan. We will strive to thrive once again! It would also be a good thing to keep our Michigan in our prayers and thoughts, too. Thank you, and may God bless Michigan and her people. This entry was posted in ARTICLES, EDUCATION, RESOURCES by Republic for Michigan. Bookmark the permalink.